The first indications within modern times that there was a real Garden of Eden came when the prominent American cuneiform specialist around 1900, Professor George Aaron Barton, from the Quaker University, Bryn Mawr College in Pennsylvania, started to translate very early Sumerian cuneiform tablets, now dated to before 3,500 BC. A large quantity of inscribed clay tablets and cylinders, had been recovered from the remains of the Nippur Library, not far from modern Bagdad, by the University of Pennsylvania, in their formal excavations during the years 1896-8. These had been deposited in the basement of the University museum, awaiting somebody with the expertise to translate them. One particular series of tablets was referred to by Barton in his 1914 book Miscellaneous Babylonian Inscriptions, as incantations and hymns, identifying them as the oldest religious texts. The contents revealed information about the senior Sumerian Gods An, Enlil, Ninkharsag and Enki, linking them to agriculture and a place Barton called Kharsag, which translates as head enclosure. This was about as far as Barton was able to go in understanding what had been written down mainly because of the mistaken belief that a religious interpretation was required, when in fact the material was secular or non-religious. We now know that a translation of such material requires what is termed as a secular common sense approach. Barton had discovered earlier in his investigation into deciphering cuneiform, that it was impossible, without going back to some three hundred vertical picture signs from which cuneiform had eventually evolved over time, under the supervision of full time scribes. These picture signs were in fact very easy to understand. During the reign of Queen Victoria discoveries and translations of ancient cuneiform text, which had appeared during excavations in the Mesopotamian plains, gradually began to reveal Sumerian stories, which were similar to the extent that they supported the Biblical historical texts. The first and second world wars totally disrupted the progress, which had been made by specialists in translating ancient documents. Nippur Archaic Cylinder - To judge from the script, the Nippur cylinder illustrated on this plate (8383 in the Nippur collection of the University Museum) may date as early as 2500 BC. Although copied and published by the late George Barton as early as 1918, its contents, which centre about the Sumerian air-god Enlil and the goddess Ninhursag, are still largely unintelligible. Nevertheless, much that was unknown or misunderstood at the time of its publication is now gradually becoming clarified, and there is good reason to hope that the not too distant future will see the better part of its contents ready for translation. Seven years later the extremely well qualified Christian O'Brien was unique in taking up the challenge, and began the immense task of learning all about cuneiform, so that he could provide the common sense secular translation of these most important ancient records. In his book the Genius of the Few, first published in 1985 and co-authored by his widow Barbara Joy O'Brien, he sets out the evidence that Kharsag and the Garden of Eden were one and the same, and that this record was a pre-historic reality rather than a biblical myth. 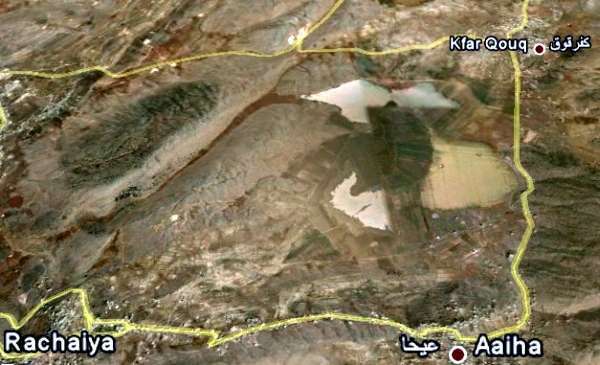 He concluded that the south Rachaiya Basin in Southern Lebanon met the requirements as being the most probable location of the Kharsag/Eden site. And further that; a group of culturally and technically advanced people who settled in this inter-montane valley in the Near East had established an agricultural and teaching centre at about 8,200 BC. (Now re-calibrated to about 9,300 BC). He derived his choice for the location of Kharsag from a wide range of disciplines, including the descriptions of the area given by Enoch when he was taken to meet the Great Lord and record all that was going on. 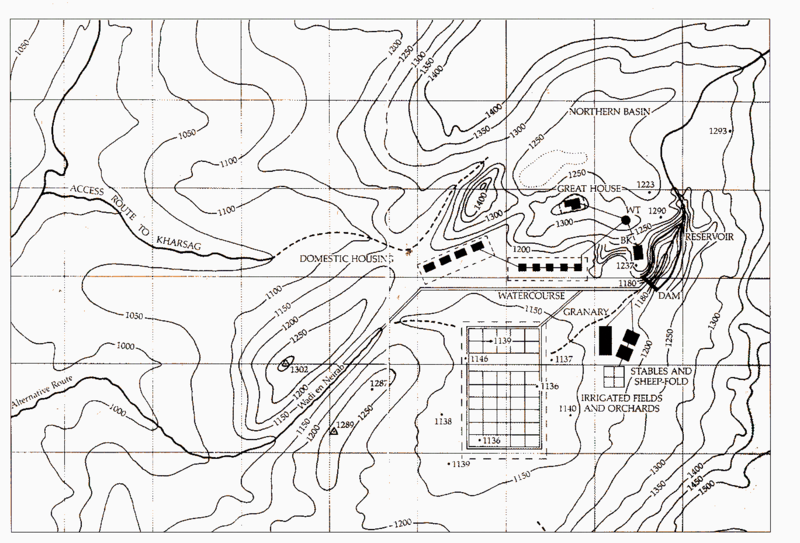 O'Brien finally used the French surveyed 1:20,000 map of the area (below), to eliminate three other possible inter-montaine basins before deciding that the Rachaiya south basin site, best matched the evidence. Christian O'Brien died in February 2001 and Edmund Marriage continues with his research in partnership with his aunt co-author Barbara Joy O'Brien, under the heading of the Patrick Foundation Golden Age Project. Our site survey of the Garden of Eden was conducted by Karl Guildford and Paul Bedson in November 2009. Their first impression was not what they had expected to see having already extensively documented the area from Google satellite images, there was no water in the southern basin (in the foreground) also the survey area was much larger than anticipated. Image courtesy of Google Earth, showing the location of the Garden of Eden..
A full range of evidence to support the O'Brien thesis is now available, and Edmund Marriage is presenting the case for the O'Brien thesis and seeking to encourage further bio-archaeological research to prove or disprove the thesis. As major damage is now being inflicted upon the ancient features in the Rachaiya Basin, we are seeking urgent action from the Lebanese authorities and the British Museum, in order that the area can be protected as a World Heritage Site. - The Lady Ninkharsag - Kharsag Epic No.2. - Translation of archaic Sumerian cuneiform recovered from the remains of the Nippur Library in 1896. 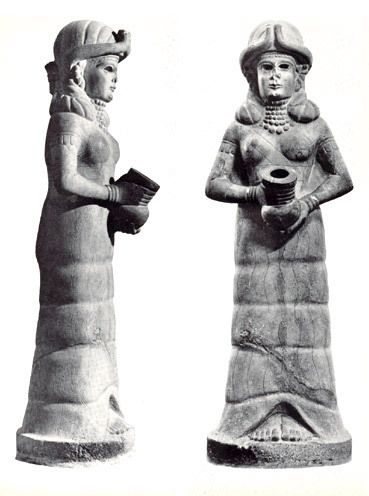 White stone statue of the Lady Ninkharsag (mama in Accadian) in the guise of the goddess of irrigation, found during excavations at Mari on the Upper Euphrates in Syria. On display in the Aleppo museum.